Slow Cooking, Done Fast! Discover more than 200 delicious recipes—from easy appetizers to mouth-watering maindishes—perfect forany pressure cooker!Why wait hours for your dinner to simmer on the stovetop, when a pressure cooker can produce delectable results in minutes? This unbelievably quick and easy kitchen tool can cook up to 70% faster than a slow cooker or oven, and the results are always rich, flavorful, and satisfying. THE PRESSURE COOKER COOKBOOK presents more than 200 recipes tailor-made for your electric or stovetop pressure cooker, covering every meal from breakfast to dessert. From tender pot roast to cheesy risotto, every recipe is simple to create and delicious to devour. 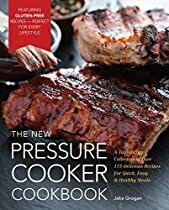 Packed with information about the best ways to use, clean, and store your pressure cooker, plus the ideal cooking times and temperatures for any key ingredient, this is the only pressure cooker cookbook you’ll ever need. Along with beautiful, full-color food photography on every page, this elegant recipe collection takes the pressure cooker into new territory, presenting gluten-free, vegan, and even paleo variations; THE PRESSURE COOKER COOKBOOK is perfect for every lifestyle!